Moving Averages – Why are These Things so Popular? 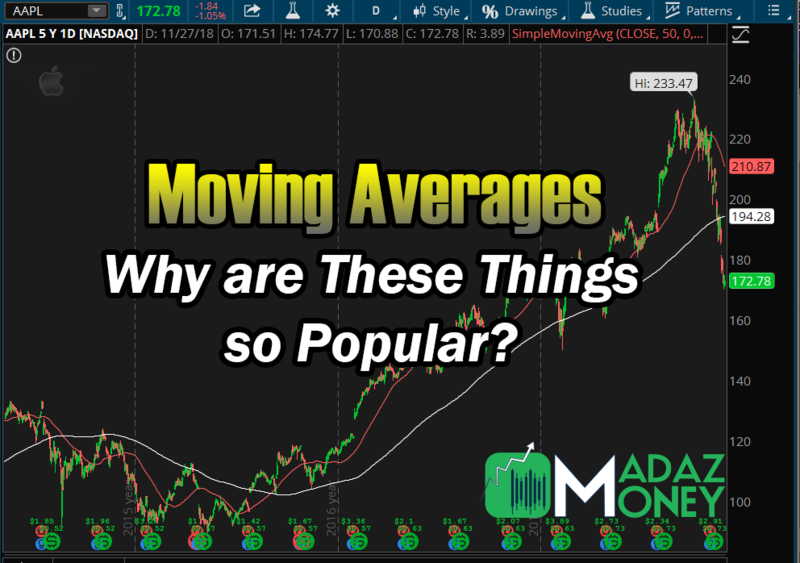 Moving averages (MA), why are these things so popular? Well, What the Heck Are They?! So, what exactly IS a moving average you ask? By definition, a moving average (also referred to as a rolling average or running average) is a metric commonly used to gauge the direction of a current trend. Moving averages are visual representations of a mathematical equation that is calculated by averaging past data in a series. There are many different kinds of moving averages including simple moving averages, exponential moving averages, smoothed averages and weighted averages. For more in-depth calculations of the averages, check out our best friend, Google. I’d much rather move on to the fun stuff myself! Ah, now on to the fun stuff! I know all of my technical trader followers are going to love this part of the blog. HOW do we set up moving averages and create a trade plan. Well, like any other indicator, how they are used is all up to an individual’s preference. What’s great about moving averages is how you can mix and match them any way you like to create a trading system that best suits you. Are you a bigger picture trader? Position and swing traders commonly utilize the 50 SMA (Simple Moving Average) and the 200 SMA. They would most likely look to create a bias if the 50 SMA is above or below the 200 SMA, with bullish sentiment in mind if above and bearish sentiment in mind if below. Or maybe you are like me and look for quick opportunities to bank on smaller time frames! In this case you can use something like a 10 EMA (exponential moving average) and a 20 EMA for moves on smaller time frames. In general, I would say its common practice for day traders to have the 200, 50 and 20 SMA on their charts. And I know you guys are patiently waiting, so let’s dive into some trading examples below! 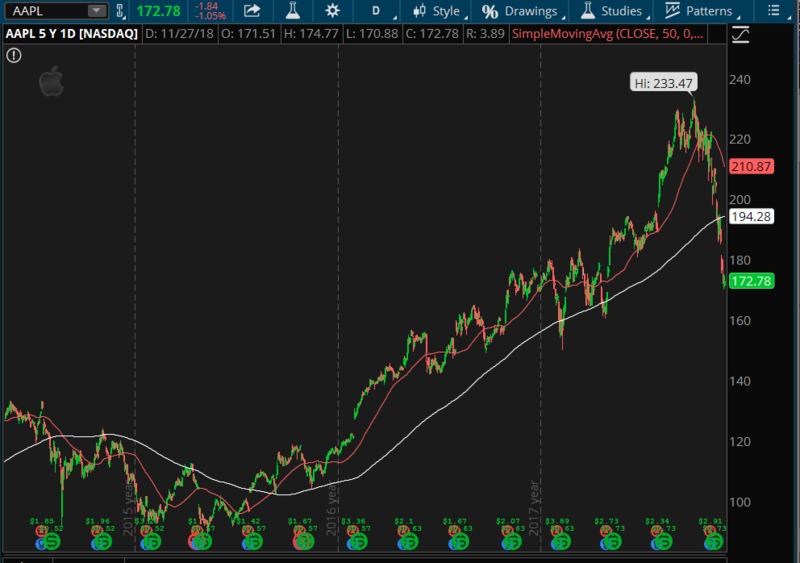 Let’s take a look at a 5 year $AAPL chart. In this example we will be looking at the macro side of things. This is very similar to what long term investors, hedge funds, and position trades are looking for. Here we have a chart with a 50 Simple Moving Average in red, and a 200 Simple Moving average in white. Look at how price not only respects, but actually reacts to how the averages are moving. We can see a clear decline in share price when $AAPL falls below the averages, and when price reclaims the averages. Notice how it may take a few days or weeks to form a trend? This is why when using moving averages, the higher the number, generally the more macro of a move involved. This is what we would call long term speculation! An example of bearish price action on this $AAPL daily chart where we see the price fall through both the 50 SMA and 200 SMA. 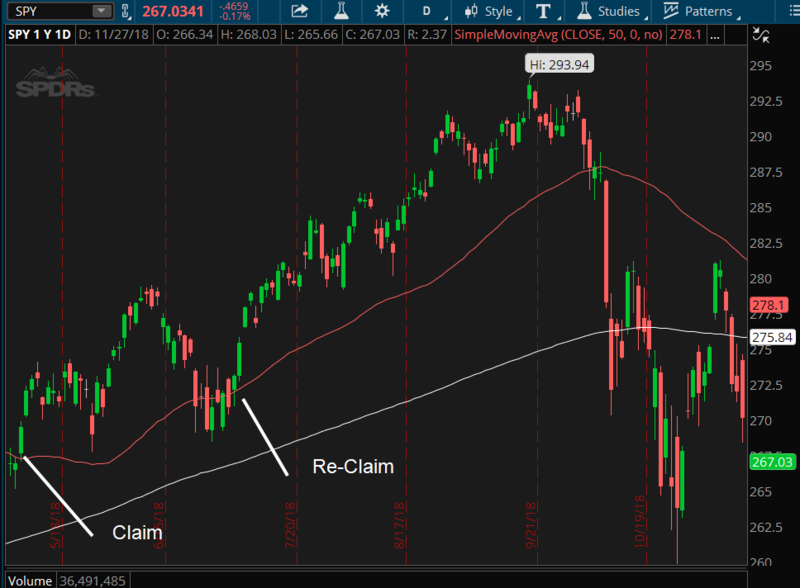 This annotated portion of the $SPY chart demonstrates a claim and reclaim of the 50 SMA, confirming bullish price action on the daily chart. As you can see by my annotations, price initially claims 50 Simple Moving Average (in red), fulfills the bullish sentiment and then sells off slightly below the average for a few days. Bears really tried to step on the gas there but the bulls took control and price reclaimed the average. This is a VERY BULLISH signal, even more bullish that the initial claim of the average! Now lets take a look at the second way traders commonly use moving averages: Price Testing. Back to our trusty $SPY chart! As shown, price commonly comes back to test averages on its way up or down. Many traders will look for a bounce or rejection at these areas, either long or short in respect to their trade plans. If a price has claimed an average and is retesting it successfully, well that is a very strong indication that the move will continue to sustain itself. Incorporate some prior support and resistance for entries and exits and now you’re one step closer to banking! 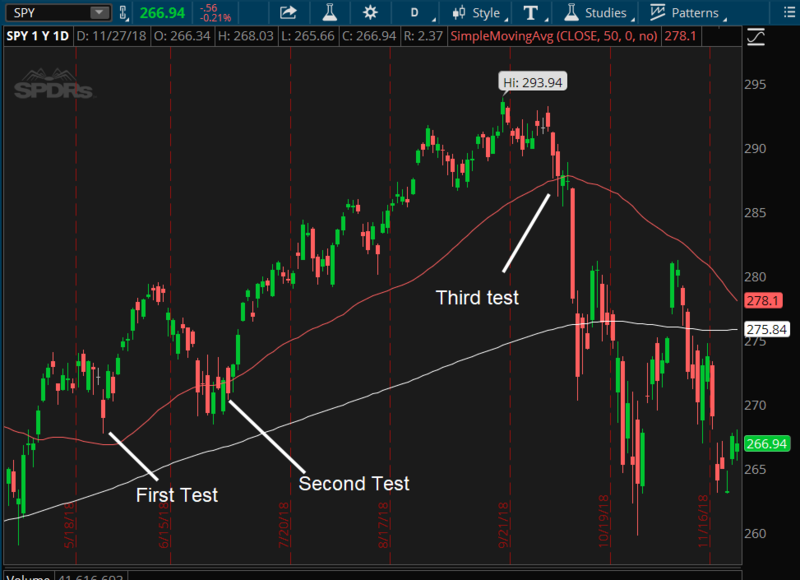 Here we see a third test of the 50 SMA which fails resulting in bearish price action on the $SPY on the daily chart. And let’s not forget about the final and most common approach to trade a moving average: The crossover! A crossover of a smaller moving average above or below a larger moving average indicates that for this period, price in the time of that respective average is bullish or bearish. For example, if a 10 SMA crosses below a 20 SMA, an argument can be made that in the short term, price is bearish. That’s speculation on a micro time frame. But remember to keep in mind that on the larger time frame, the 50 SMA may still be above the 200 SMA, indicating that the overall long term trend is intact to the upside, and that this current bearish move may not last very long and only be a retracement or some short term consolidation before the next leg up. This is why it’s so important to utilize multiple time frames in your trading approach when creating a trade plan. Now let’s put it all together with some claims, reclaims, price testing and crossovers on our $SPY chart. Im going to add a 20 SMA which will be in yellow. Ill even add in a little “cheat sheet” on price sentiment for everyone to study so you can start creating and testing bullish and bearish sentiment on your own! This chart shows several examples of a shorter term Moving Average, the 20 SMA and how the $SPY reacts when it crosses the longer term Moving Average, the 50 SMA. We can see that when the 20 SMA crosses over the 50 SMA, the result is bullish price action. Conversely, when the 20 SMA crosses under the 50 SMA, we get bearish price action. 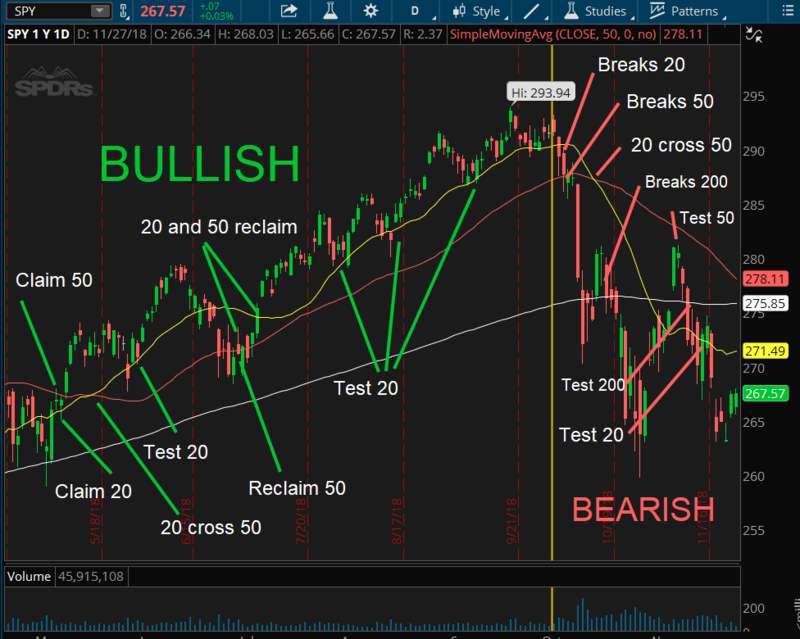 Here is the full chart giving you a detailed view of all the signals we’ve discussed and a cheat sheet line in the sand, which is the gold line between bullish and bearish sentiment on the $SPY. You can easily see how price starts by trending higher and successfully holding, testing, and reclaiming averages. Then when price breaks dramatically to the downside, we now have reference points to look at for placing trades. If you’re long and price is breaking the 20 SMA, it might be time to consider where you exit is. Will It reclaim? 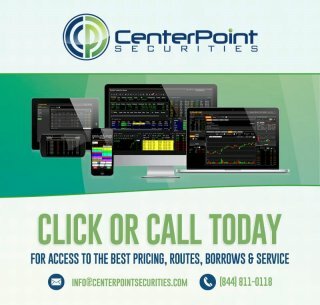 Price action doesn’t lie! Or did you get short on the break of the averages? You may want to use higher averages to help you determine if price is still bearish or if it was a quick sell off. In this example, longs and shorts were kept safe if following guidelines! Okay guys! That’s sums up my approach to moving averages! Now you know what Madaz is thinking when looking at charts and some of the tools I look at when creating a trade plan. What’s great is that these examples and setups work on ALL TIME FRAMES! Play around and study which pairs work best for your style with different combinations! As a general rule of thumb, shorter term SMAs typically work better for shorter time frames and longer term SMAs typically work better for longer time frames. I cant wait to hear what you guys find! Make sure to drop a line and let me know what the next blog should be about! Until next time my technical trading savages.